Fox Sports announcer Joe Buck expressed relief Friday that he didn't flub his father's signature "see you tomorrow night" line Thursday night, when David Freese's walk-off home run in Game 6 of the World Series unfolded 20 years later under nearly identical circumstances to Kirby Puckett's heroics. On Oct. 27, 2011, the righthanded-hitting Freese hit his winning solo homer for St. Louis to lead off the bottom of the 11th inning of Game 6, forcing a Game 7 Friday night vs. Texas, won by the Cardinals. On Oct. 26, 1991, the righthanded-hitting Puckett hit his winning solo homer for the Twins leading off the bottom of the 11th inning of Game 6, forcing a Game 7 the next night vs. Atlanta, won by the Twins. And the national television audience for each heart-thumping moment heard nearly the identical home run call. The first from Jack Buck: "And we'll see you tomorrow night." Thursday's call came from Joe: "We will see you tomorrow night." Tim McCarver was the announcing partner in each instance. In a telephone interview from Busch Stadium before Friday night's Series finale, Buck said he felt that "as the game was building" the line might come in handy. "It was just so clean," Buck said. "It was just like Kirby's home run." Borrowing the call, he added, was not only a tribute to his father, who died in 2002, but also the perfect line for the moment. "Everything I do is a tribute to my dad," he said. "It was a wink to him, having it be in St. Louis, a home run by a St. Louis kid." Jack Buck was the voice of the Cardinals for nearly 50 years. "It was a fitting call," said Joe Buck. "One quick, short sentence. ... I'm proud of the moment, and I'm proud of not screwing it up." Seven years ago, the younger Buck put a twist on his father's famous call during Game 4 of the American League Championship Series, when the Boston Red Sox beat the New York Yankees on their way to their first World Series title since 1918. The 5-hour game ran into the next morning, ending on David Ortiz's walk-off home run in the 12th inning, inspiring Buck to say, "We'll see you later tonight." 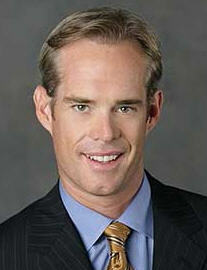 Joe Buck is an ASA Lifetime member and his father, Jack, was inducted into the ASA Hall of Fame in 1990.